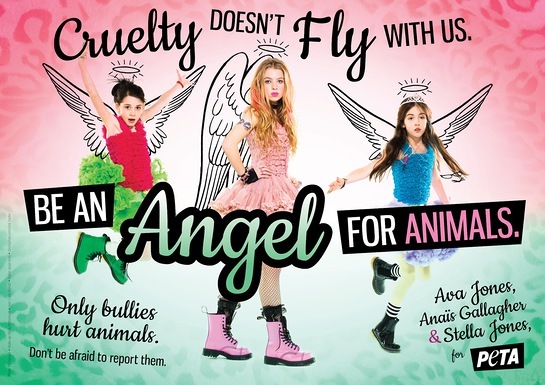 Dressed in combat boots, tutus and cartoon wings, 13-year-old Anais Gallagher, 10-year-old Stella Jones and 8-year-old Ava Jones – daughters of Oasis' Noel Gallagher and The Clash’s Mick Jones – are the young stars of a brand-new PETA advert that reads, “Cruelty Doesn’t Fly With Us. Be an Angel for Animals”. The ad, which was shot by top celebrity photographer Pal Hansen, goes on to advise, “Only Bullies Hurt Animals. Don’t Be Afraid to Report Them”. There are more reasons to report animal abuse: studies have repeatedly demonstrated that children who abuse animals are more likely to bully classmates and grow up to be violent adults. Parents can help instil empathy for all living beings by always teaching children to be kind to animals. 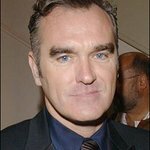 Anais, Stella and Ava are part of a long list of prominent people – including Justin Bieber, Lea Michele and Pink – who have teamed up with PETA and its affiliates to promote compassion for animals.